We talked mostly about three things today. The first you can hear more about in the BLURBS! section below, and that was the launch last Weds. 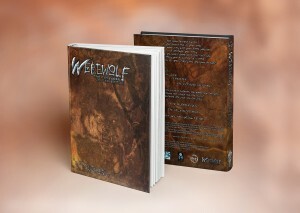 of the Advance PDF of the Werewolf: the Forsaken 2nd Edition featuring the Idigam Chronicle core rulebook. Awhooo! Very pleased with how well the book came together and with how excited folks have been with the new ideas and shifted first edition emphasis that Stew Wilson and his team created. And I’m loving the new cover- there is a directness to the challenge of that staring wolf that crackles- thanks, Mirthful Mike! Just a word about the Advance PDF idea. This is something we’ve been doing for different projects for well over a year, and we’ve been so thrilled with the results that now any of our projects that aren’t from a Kickstarter come out first as an Advance PDF. This is pretty much a stage where we are looking for members of our community to do what they always do with our new books and let us know about any mistakes or hard to understand areas that they find. It is the idea that a thousand eyes are better than a dozen. So why is this good? Well, in three ways. First, it’s good for those members of our community who love to dive into our books and pick them apart (in a loving, caring way, of course). Some of them are eagle-eyed catchers of spellcheck errors and grammar, some are systems checkers who can note a misplaced + or – from a mile away, and some are setting enthusiasts who know the lore as if they actually lived there. The important thing is that everybody has an area that they can help us with, and so they get the satisfaction of being involved with the final stages of the project by helping (or bragging rights for being smarter than us, as if that was hard to accomplish!). Secondly, it is great for everyone else who buys or intends to buy the book, as you are getting a tighter, more polished project. And finally, we benefit because we have a happier community overall, not just on release day, but into the future as new folks buy the book. Which is not to say the Advance PDF idea is without a downside. WtF fans who don’t want to know about this stage of polish and tweaking, who just want a PDF and/or PoD book please, have to wait for us to get all that errata input and the new PDF uploaded and the print files sent out. So, more waiting because of this stage. For us, we lose out on those big release day crazy sales and comments and eighty new threads across the forums because not everyone who wants the book will buy it at the Advance PDF stage. We’ve even made it painless financially to get the Advance PDF and then get the PoD physical book later with a discount to the combo price, but it is still not a single trip to DTRPG. And we also lose out on DTRPG’s leader boards for the same reasons, so our projects don’t look as successful as our friend Monte Cook‘s, for example. But we knew these things going in, and while they are unfortunate, the upside is just so significant that we’re willing to take these hits in order to have the tightest book possible at the end of it. So after that “digression”: How about this new website?! Massive kudos to Impish Ian Watson and Mirthful Mike Chaney for their behind the scenes work these last few weeks putting all the pieces together over the skeleton created by my old friend Mike Wendell. That Mike and I have known each other since before I moved to Georgia, the first time, and he sold me the first desktop publishing and 3-D animation desktop system ever used in TV in my home town of Philadelphia. I had a hunch that there might be something special happening with these desktop computers, and convinced the management at TV29 to invest in a system so I could do animations and advertisements on it. Mike was the jack of all trades and salesman at the PC company that we went with, and sometime later replaced me at the station when I headed to the start-up White Wolf. A bit later he started his own web design company and a chance meeting on Facebook later and I got him doing the site design. But again, if it looks sweet, it’s because of Ian’s diligence and Mirthful Mike’s seemingly endless ability to juggle projects. We’re still fine tuning, it ain’t perfect, so hang on and watch it evolve. Also, we have no evidence that the work on the website caused any of the slow-downs or shut-downs last week except the one Saturday night when Ian took the site down to implement the new one. But that sure is the sort of coincidence that makes me grind my teeth. Almost ready with our spankin’ new site and the old one keeps crashing? WTF? (Not to be confused with WtF 2nd Edition). Finally, we talked about PAX East, as both Mighty Matt McElroy and Fast Eddy Webb, and his lovely wife Michelle, attended over the weekend. I thought this was turning into a really appropriate convention for Onyx Path to attend from what I was hearing the last couple of years, and everything Matt and Eddy reported today just confirmed that. Back in the day, we had hoped that DragonCon in Atlanta would become a true multi-media convention, but that seemed to collapse, and for a while San Diego Comic-con was heading that way, but Hollywood invaded and drowned that. PAX East seems to, so far, be headed in a very good way with electronic gaming and tabletop actually being seen as complementing each other, not threatening. I’m very interested in the many attendees who have never heard of D&D, never mind World of Darkness or Exalted. This may be a very good place for Onyx to talk to new gamers who are interested in a more face to face kind of gaming than League or WoW really are about. Plus, if they liked the eras in Assassins’ Creed…think of what they might enjoy playing in nWod Dark Eras or the Trinity Continuum. Also, despite the corporate connections of how they started, the PAX East staff seem to be really focused on including everyone in our community and several of our friends in gaming really appreciated things like the Diversity Lounge. And I hear that they have at least one “time out” area for when all the people and noise and pressure just get too much. I know I could have used that many a year at other cons. I’m going to be asking around about those sorts of things, but if they really made that sort of effort, then I’m thinking we should look into attending next year. Certainly worth making further plans for. Above is a mock-up of what the PoD physical book versions will look like once we get to them after assembling the errata and adding in the missing sheets and index. We held back on the index so that any changes we might have needed to make to the book wouldn’t cause us to have to redo the index. That is a task that you don’t want to do twice. The DM’s Day Sale is ending on the 10th at DTRPG, as you can see from the slider on the front website page. Hundreds of PDFs are on sale including the God-Machine Chronicles, Mortal Remains for Hunter: the Vigil, and The Skinner SAS for Werewolf 20th! M20 How Do You Do That – Wrangling artists. Wraith 20 – Don’t get excited… just continuing to get new Guild titles in from Cobb. Sothis Ascends – Charles is working on it. Should see the first proof in a couple of weeks at the most. Borja is finishing up his last two halfs and I should have the maps in from Craig. V20 Lore of the Clans – Got three (almost four) chapters done. Thus far, looking like a bunch of mini clanbooks. Depending on how things go with Dark Ages errata, I should be able to get some KS graphics done before end of the week. M20 Screen – I finished the front of the screen (aka the hard part), but Phil will need to go through his list of requested tables and prioritize. Yes, all the tables are important, but there are only three panels. Art of CB – Odds are, there will never be a “perfect time” to work on this, so I’m setting aside an hour a day to work on it. M20 – Still proofing. Phil says he’s almost done. WtF 2 – Errata compiling. Getting the standard two week errata pass. VDA20 – Fixing up all the errata… hopefully. Once that’s all taken care of, we can get it off for indexing. VDA 20 Screen – Hopefully, none of the errata will mess with the tables… and thus the screen. Holding off on sending it off to the printer until we get all the errata done. BotW 20 – Awaiting next phase of cover proof. Screen is printed and awaiting the book. Fallen World Chronicle Anthology – Uploaded corrections and PoD files last week, so it should be good to order a copy for proofing. Ex 3 Anthology – Should be going out shortly to backers. Dark Eras – Holding pattern until all the text changes from the KS are finalized. When the text is done (and only once the text is done) it will go into layout. Exalted 3rd Edition – Waiting for Developer changes to text. Maria asked for a meeting to review the art that we have and the fixes still coming in as one big collection, so later in the week we will talk. Shirts – Depending on how things go with other projects, probably going to knock out the WtF Auspice shirts and the MtA Marauder shirt. If I can find a good version of the generic Technocracy glyph, I’ll do one for it up as well. REASON TO DRINK: Pre-Saint Pat’s Day. What? It’s totally legit. ◀ Welcome to the new Onyx Path! Small correction: The GM’s Day sale ends tomorrow morning. There are 15 hours from right now. I was juggling a lot of the new site stuff so I accidentally miscounted when I put that slider image together. D’oh! Sorry, everyone. Exalted finally feels within reach. And I have a new game group after moving. It’s nice how the universe lines these things up for you once in a while. I believe that chunks of salt is a wise way to proceed. How much salt? I.e. how significant are the text changes? I won’t know until the Devs come back to me with their changes, but they’ve been working hard at it for almost, or a little over, a month. So we should have something to review and get into layout soon, I’d expect. But again, that’s why we need the salt, as expectations don’t trump reality. WtF 2nd Edition is fantastic. Love the cover, and love the new website, too! Now that we change change between the background sliders, everything is perfect-o. Unrelated question, but I figure I can know you’ll see it here. I’m one of the Dark Eras backers. I sent out my reply email last week and still haven’t gotten any sort of response. I’m not sure if that’s normal or not, but I figured I’d ask because I just read that someone else had some issues with getting their emails through. PS – Really digging Werewolf 2.0! I have not yet confirmed the various requests with the Development team. I’ll let you know the responses I get from them when I do, though. Thanks! Exalted being in rough layout are you going to be able to give us some kind of estimate on we can get the advance PDF for it? I haven’t for over a year, so it wouldn’t make sense to estimate anything now. The fact is that *I* want Onyx Path to put out the most beautiful, tightest, glorious books it can. It makes me happy that you agree with this outlook! Nothing wrong with having an attention to detail. Just remember that there are real errors and there are choices the designer has made for _reasons_. I say that because sometimes people get upset to discover that we didn’t actually “correct” something they pointed out that was as intended. Don’t remember if that ever happened with your notes specifically, but its good to get out there. Thanks! I really like the new design, and I also like the little changes here with the Art Direction part of the Monday Notes, it’s less “chaotic” and it gives us hints on the actual progression of the books on this part. That’s really cool, thanks. Glad you like the AD area. Now we have to remind Mike to take care of it and keep it tidy. I find that I miss seeing comment totals on the homepage and at the top of each article. I’m realizing I used to use it to quickly see, from the homepage, if new comments had been posted to an article without clicking through and scouring them to see if there’s anything new (or not). Any chance that can return? OK, that was fast. Usually would take a good 5 or more minutes for a comment I posted to actually process. This is quicker today. Much quicker. I was wondering why Ian had put up a whole new website just to fix some server issues. Looking forward to the Ex3 anthology. Ian’s just like that. Overachiever. 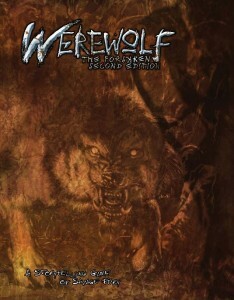 Werewolf the Forsaken 2e is fantastic; you and your team really did a great job on it. Does that mean Promethean 2e is next? If so, are there any estimates on when it might be coming out? Thanks so much! Nope, we don’t do release estimates any more. Just keep your eye on the weekly Updates for anything you are interested in and you’ll see it head towards release pretty clearly. Thank you! I’m really glad that so many people are enjoying WtF2e, both long-time fans and those who weren’t grabbed by the first edition. The Advance PDF concept really appeals to me in theory. The biggest downside I’ve found with it is when the coupons for PoD copies don’t have clearly marked expiry dates. I ran into an unfortunate issue with my “Guildhalls of the Deathless” Advance PDF copy – I had intended to save the coupon for when I was setting up a larger order, but by the time that was the case it had expired and DTRPG customer service couldn’t do anything about it. I’d have liked to pick up physical copies of Mummy supplements as they came out, but since that issue I’ve sort of stayed clear and wary. Again though, Advance PDFs are a great idea when everything works out. On another note, 2015 is already looking like a magnificent year of releases. You’ve got some intriguing stuff on the assembly line. Upon further reflection, it’s possible that I received my coupon code for the Guildhalls PoD from DTRPG customer service to begin with after having had trouble receiving the standard email. That would explain why I was unaware of the expiry date, as I have to assume it would have been in the body of the email proper. I’m sure by now the system is working well for you folks, and the bad taste that my initial experiences with it left in my mouth will fade. Seeing Dreams of Avarice so far along is encouraging! I’m really looking forward to seeing Mummy lore probed from that heretical angle. I guess I’m getting ahead of myself though- Sothis Ascends is bound to be brimming with new questions and answers itself. Between that and Dark Eras there is going to be a phenomenal amount of inspirational material for storytellers and players to draw from while piecing together deathless pasts. WTF2ed had a very funny effect on me. While I’m reading, it makes me want to get down on all fours, howl and hunt. Yep- soon as Mr Brucato is done we can move onto the 2nd proof. Looking forward to it. So what is the difference between waiting on dev notes and dev revisions for EX3? Not a thing. Different ways of saying the same thing…waiting on the devs. I just wanted to thank you and the developers and writers and art direction and everyone involved in getting WtF2e out to us. I’m loving the book and it’s great seeing an influx of new people on the boards, hopefully a trend that will continue along with renewed interest. Thank you. Everyone involved on the writing side is really proud of what we’ve put together, and I’m sure Mike would say the same of the art and design team. WtF2e is fantastic! Great work to everyone involved. Im very happy with the way the game was developed. I love the openness and the new options that WtF2e gives you, both as a player and as an ST. It is a different beast indeed. Cannot recommend this book enough! I think the advance PDF works well. I will buy PoD when that is available anyways. I think it is great the the community is helping ut OP making a better book. In this day and age it is good to have such a committed base of forumites, fans and supporters. The new site looks very pretty. Not found a lot I dont like with it. Good stuff! Thank you. Getting feedback on the advance PDF is a little like getting redlines as a writer — initially, you think “oh no, look at all the stuff I didn’t catch”, but once that passes you’re glad that so many people are helping you make the book as good as possible. Hi there! I’m just tossing a note for the suggestions box: You should include the link to the blog post with each newsletter broadcasted through e-mail. I read most of my news from newsletters these days, and the possibility of going to the webpage with just a click is very important to me. For example, I was reading about how cool the new webpage was looking, but I was reading it from the mail and I didn’t have the link to go and see now. That’s a missed CTA opportunity I think. Anyway, congratulations for another fantastic 2nd edition book!! I loved Werewolf, in all its incarnations, from day one, so seeing it in all its present day glory is just pure awesome. Thank you. I’ll mention that to Impish Ian- thanks! Glad you’re enjoying WtF2! Unfortunately, with Mailchimp’s auto-post feature — every Monday Meeting post is automatically sent to the mailing list — there’s no way to customize it to add links back to the website. It’s sent as-is. There’s a link to the feedback thread in the forums right there in the post. Can a Tzimisce Vampire join two humans back to back into one organism without killing them? Does Vicissitude levels 1 – 3 cause damage? If so how much? Did you mean to ask these questions here, or on our friendly and fun forums? I think the vampire forum community would have a blast going back and forth on those questions. Comment on new web site. Good overall, just a couple of issues. 1) When I click Current Projects->Monday Meeting, I get an entire screen of grey nothingness. I have to scroll down to see something. It took me a while to realize this. At first I thought it was a bad link. 2) It is important to have up to date information and recent news information. In most cases this is true but if I had heard of Scion and clicked over to the Scion part of the website, I would be disappointed. – Scion News: The most recent post is September 3, 2014 more than six months ago. – References to Second Edition not clear. Sure it says Second Edition at the top but almost all other references are to 1st edition including links and news articles on how to buy 1st edition. If you are working on 2nd edition and the latest news link is 6 months old and 1st edition information, I would assume a dead game line. But as I said at the beginning, I really like the new site and the new format for the Layout section of Monday Meeting. Both the Scion and Trinity sections are among the ones that we are still working on- thanks for the notes, they’re very helpful! Unfortunately, I can’t replicate the error you’re having with the Monday Meeting link. It works fine for me. I’m having the same error, though in my case my browser shows that the grey nothingness (blue on my browser) is a broken image of enormous size. It is indeed huge. as much as I love advance PDFs, my personal preference will always be for you guys to do whatever’s best for you financially. Very much appreciated. I look at it as long term and short term values, and sometimes circumstances make the short term value the one you have to go for, like getting a book out for a Con premiere. Having a cleaner and tighter book invests in the long term value, since these books don’t go away. I am not sure how Dragon Con cannot be called a Multi Media convention, it has everything but electronic games unless you like mech warrior. I love VDA 20, I am very glad it got a core and not get a supplement book like werewolf wild west. Are there any plans for more VDA 20? I am still chomping at the bit for Exalted 3rd ED; the group I run even know that “rock fall, everyone dies” will happen when I get it just so I can run it… Also I cannot wait till the Lunar or Infernal exalts come out. I’m sure the DragonCon folks still try, but my impression of several years back is that they failed to achieve critical mass with multi-media. The fact that you mention them having no electronic games pretty well says they either didn’t rate as worth it for that market, or they deliberately exclude electronic games which is the sort of exclusionary thinking I mention in the post. Or maybe there’s another reason I’m not aware of, I really have not looked into it after it seemed obvious they were stuck at regional con level. There’s not a thing wrong with that, and if you still go and attend and enjoy it, I’m not trying to rain on your parade, but as a business with an international community of fans, DCon doesn’t have all the pieces I’m looking for. Love the new site: I can actually read all of the text in the reply section now, it had all disappeared previously. 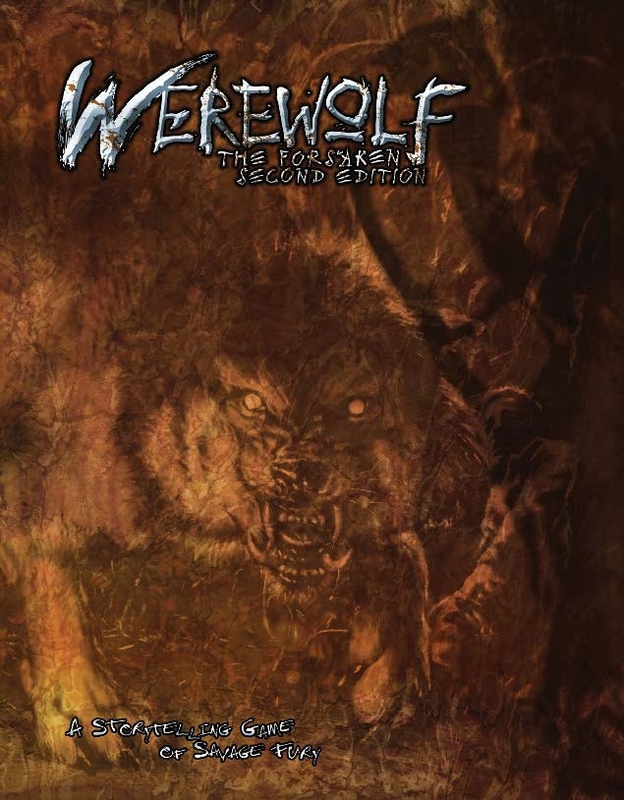 Werewolf 2E is excellent; I have a half dozen people ready to play when the hardcopy hits, at least one of them biting their hand in anticipation. Can’t wait to see what kind of crazy pack they make: I’m thinking huge extended family somewhere in the Washington Cascades. Still waiting patiently for Exalted 3E as well. That was one of those “work in progress” issues, glad it’s working for you now. Thanks! I’m really glad the Advance PDF system is working out for you. I’m hoping that you consider extending it out to 4-6 weeks for EX3 because it’s a big, intricate book, but it might not be worth the extra downsides. EX3 breaks all the rules, so we’ll just have to see. My guess is that we’ll have more subjective “errors” than typos, but we’ll see when we get there. But yes, we’ll continue to give it the time it needs. I also have thought the “advanced pdf” the backers get and look over is a plus in the long run as it makes for a better book imho. As due to my background in CIS and code, im one of those error spotters and I don’t mind helping out Rich and Satryos and those at OPP with the books we all love, as those “brain trusts” can only do so much. I guess we take the place of those underlings they had when they worked at White Wolf to an extent which I don’t mind at all. He he: underlings. Not sure who they were but I remember when we each had daily chores around the office, from owners right through management. Cleaning our film processor of its chemicals gave folks superpowers. Any news on Scarred Lands? I haven’t looked around the new site much since I usually only come for the forum and these MM notes. The threads of comments here look much nicer. The forum looks… the same? Which is just fine! But when I go to the News page it’s now awkward because there is an enormous (and broken) image taking up almost the whole screen, so I have to scroll down a ways to get to the actual news. It’s merely annoying but it is that. There’s definitely something that needs fixing on both the Open Dev and Monday Meeting pages from the pulldown menu. I sent a note to Ian. Uh why can’t I post? It won’t let me try again, it claims I “already posted that” although clearly, I didn’t, because nothing’s there. Looks like the site is slowing down again, and that might be part of what you are encountering. But I am seeing your posts, because I can answer them, so not sure if that’s just a sluggish interface/response. I’ve been looking through WtF 2nd Edition and really liking it. Ill admit that Werewolf was one of the games that kind of passed me by as I was more interested in the other lines, especially Mage. However I’m REALLY liking what I’m seeing here. The background stories are good, the information on what’s going on is done well. Another thing I really want to thank people for, for both Werewolf and Requiem 2nd edition is the inclusion of a more traditional Table of Contents. I love the World of Darkness books but sometimes it was really hard to find stuff without using the full index at the back because other than the names of the chapter’s traditionally it seems the books didn’t really HAVE a table of context. So Kudos for the people who got that put in as it will make this and Vampire much more ‘user friendly’. Looking forward to the Mage Books (2nd Edition of Awakening and 20th Anniversary of Ascension) and Exalted 3E so keep up the good work. It was suggested by a bunch of fans really early in our start-up, and is something that we don’t need an extra person to do, unlike the Indexes, so adding a ToC was easy to make part of the normal workflow on a book. So useful, asked for, and not something that adds another stage to production. Pretty much a winner! I’m really looking forward to reading WtF 2e, but I want to wait until the PoD edition is available and get the physical + digital bundle. Anyway, having a bit of an issue with the site redesign — there’s no readily apparent way to go back more than ~10 posts in any given category (using the ~/category/whatever path). Obviously it’s not a huge problem if you just want the latest news, but looking for older posts generally doesn’t seem possible; the search is an option for specifics, but that seems suboptimal especially if you don’t know the exact title of the entry. If you get the advance PDF during the period it’s available, you’ll get a discount code for the PoD when it’s ready so the total price you pay is equivalent to getting the physical+digital bundle. Being able to scroll back further is on my list of fixes to make. – looking forward to the projects you have coming up. im almost shaking with excitement. esp EX3. – considering you guys went to pax east im curious if any of you wanted to go/went to “Tenno Live” on saturday?